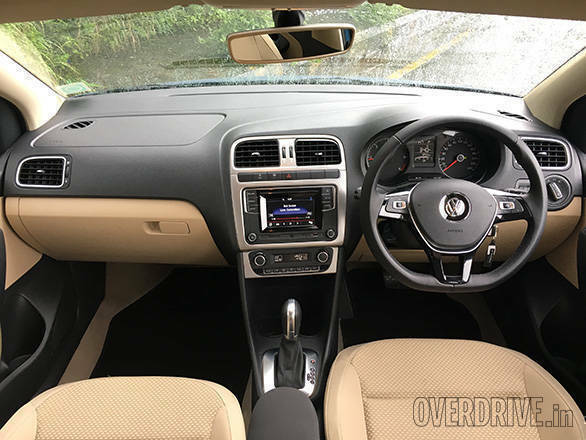 Despite having called out the Volkswagen Ameo for being the latecomer to the compact sedan party, we were impressed with most of what it had brought along - plenty of segment-first creature comforts and more importantly a decent kit of standard safety equipment for the asking price range. The fly in the ointment, however, was the 1.2l 3-cylinder petrol motor. To me, the engine seems good enough only for urban commutes - blame it to the lack of power and grunt. On the highway or on hill climbs it is a dud. What good is the extra boot space over a hatchback if your compact sedan can't support your road trip ambitions? Well that could change now, for what we have here is the Ameo diesel. It doesn't look any different from its petrol-powered sibling save for the TDI badge, so let's cut the design talk and jump straight to the engine. 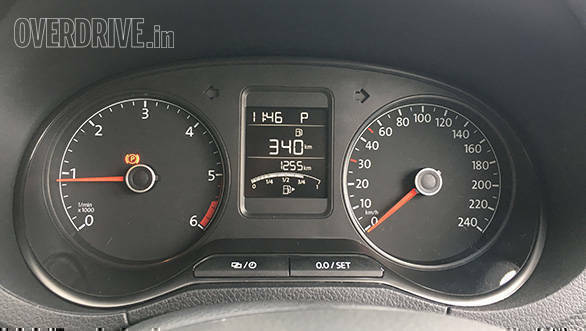 The Ameo diesel is powered by a 1.5l 4-cylinder motor that we are familiar with in the rest of the Volkswagen range. It, therefore, starts off with the typical gravely note and settles into a fairly silent idling speed of 800rpm. Quite similar to the Polo then, but the noteworthy difference with this engine is the state of tune. 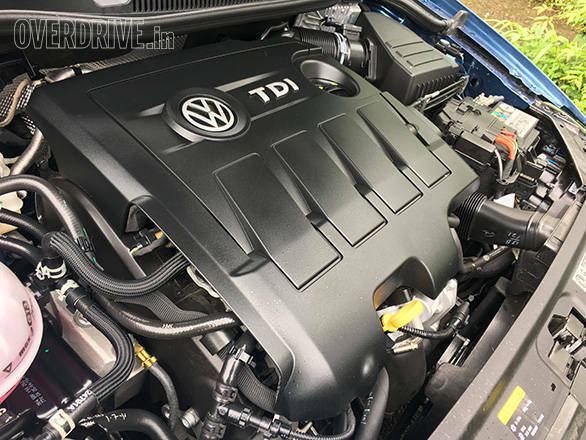 The 1.5l TDI engine now puts out 110PS under the Ameo's hood - which is 20PS more than the Polo and five more than the GT TDI. It also has a healthy torque output of 250Nm which, though similar to the GT, is available across a wider rev-band. The result is an improvement in driveability in conditions like city commutes, overtakes and twisties where the mid-range grunt makes all the difference. It will also take your nuclear family and their weekend luggage for a trip with more enthusiasm than its petrol sibling. Volkswagen is offering this engine with two gearbox options - a 5-speed manual and a 7-speed DSG automatic. We had plenty of time on our hands to try out both the options. Let's begin with the automatic. As seems to be the norm in the segment now, the automatic is being offered on the mid and top trims on the Ameo diesel. The pricing for both trims is about Rs 50,000-60,000 more than the corresponding diesel automatics (AMT) of the Swift Dzire or the Zest, but the Ameo diesel easily outclasses them with its quicker and more seamless dual-clutch operation. It does display the typical shortcomings of the entry-level DSG boxes from VW. It's slow to upshift when responding to part or even full throttle. It is a tad bit better in the S mode, but we would have liked faster responses for the city-friendly D mode too. Downshifts, however, are quick and aid in brisk engine braking as well. On the highway, the Ameo diesel automatic can cruise at 100kmph at a relaxed 1,800rpm in D mode or 2,200rpm in S mode. In the latter, the gearbox also chooses stick to sixth gear instead of seventh, in order to remain alert for quick roll-ons or overtakes. City commutes seldom see the tacho cross 2,500rpm mark. Fuel economy, therefore, should be decent. 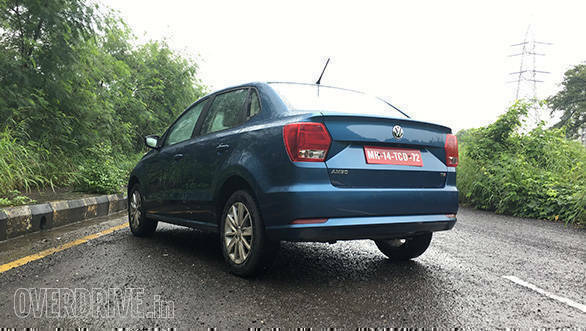 Unlike the Polo GT TDI, the Ameo isn't exactly targeted at the enthusiasts, it actually ends up one-upping its hatchback sibling on the performance end too. While the GT TDI managed a 0-100kmph sprint in about 11.4s in our tests, the Ameo diesel automatic did the same in 10.9s! The manual transmission impressed us further by going 0.1s quicker than its automatic counterpart and becoming the quickest diesel compact sedan we have tested so far! The manual transmission is quite good too. Around city it can get a bit cumbersome than its rivals, partly because of the heavy clutch and partly because of the long travel of the clutch pedal. Hyundai and Honda do a better job at this. But that said, the meaty mid range of the 1.5l motor also demands far less gearshifts than some of its rivals. At speed there is a bit of transmission shock that we have come to associate with most VW manuals now. With the manual gearbox, this engine needs about 2,000rpm to cruise at 100kmph. Fuel-economy figures on the multifunction display were quite similar to the automatic, hovering around the 16kmpl mark overall. Stability at highway speeds is excellent. The suspension seemed slightly on the stiffer side as compared to the revised set-up on the new Polo that we reviewed in 2014. It crashes in deep potholes and doesn't feel as supple as the hatch when encountering sharp bumps - almost reminding us of the older Polo. The stiff set-up also means there is a bit of skipping and tracking when you hit a series of undulations, and there were plenty of those on our drive through Mumbai's rain-soaked roads (even in October!). But show it smooth roads and the Ameo diesel will impart the same taut feeling that you associate with most German cars, and handling therefore is confidence inspiring. The grip from the Apollo Alnac 185/60-15 tyres is quite good too, and despite having hit some really deep and sharp potholes, we were glad to return the cars back to Volkswagen without any cuts or punctures on the tyres. 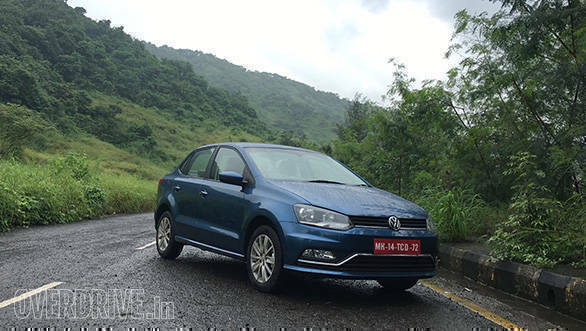 The dynamics of the Ameo petrol had left us impressed too, but the engine was a let-down. The diesel motor fixes that. 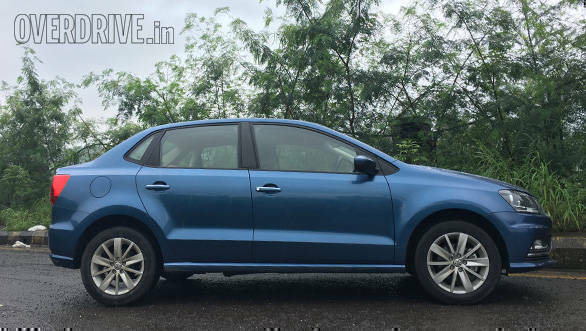 In fact, we have stated in our previous reviews of the Ameo that we were impressed at the fact that Volkswagen kept its promise of delivering a premium and feature-rich product in the compact sedan space. The diesel variant cements that commitment further and in the process also ends up impressing both sides of the market - the economy conscious and the enthusiasts. Furthermore, a healthy list of standard safety features and creature comforts make it a more valuable offering than its petrol counterpart. We are impressed and we believe that you will be too.